Personnel - Brittany Anjou: piano; Greg Chudzik: bass; Nicholas Anderson: drums + guests: Ari Folman-Cohen: bass; Ben Perowsky: drums. 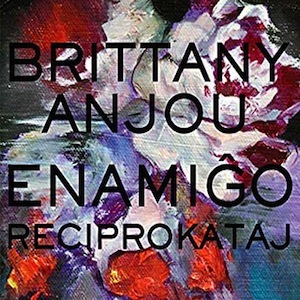 The well-traveled American pianist/composer Brittany Anjou titled her debut album in Esperanto because that language mirrors jazz improvisation in the way that both promote intercultural dialogue, democracy, and self-expression. Inspired by Igor Stravinsky’s Petrushka ballet, Enamigo Reciprokataj means reciprocal love and its content is defined by original compositions, some of them honoring great pianists. Featuring Greg Chudzik on bass and Nicholas Anderson on drums, the album includes an additional team of foundation builders - bassist Ari Folman-Cohen and drummer Ben Perowsky - on the two last tracks. “Starlight” and the “Reciproka Elektra”, opening and closing tunes, respectively, are adorned with electronic manipulation and are strictly connected with each other. The former piece shows a strong grasp of melody and rich post-bop tradition, while the latter gets both trios together in an electronic composite that conjures up offbeat techno-like trances. The five-part suite Reciprokataj, a shapeshifter, plays a central role in the journey, offering a variety of environments while bridging tradition and innovation with epiphanic manifestations. The classical influence on “Cyrene (Flight of the Butterfly)” is monumental, just as much as the rhythm is vertiginous; “Girls Who Play Violin” feels looser, exposing sweeping piano, plaintive pizzicato and arco bass, and rich cymbal work; the epic block chords that instate “Harfa” takes us to a cool, round 4/4 harmonic progression and relaxed brushed drumming that call for Anjou’s improvisation; and the lushly driven, 5/4-metered “Olive You” contains crescendos, sudden explosions, spiky accents, and melodic spirals, until the tempo is modified, firstly to accommodate the bassist’s solo and, secondly, drum stretches over a vamp; lastly, the compact pianism of “Flowery Distress” impelled me to imagine a musical crossing between Moby and Aaron Park’s Little Big, a sort of electronica-meets-indie-rock scenario. Intercalated with parts of the suite, there are tributes to influential jazz pianists: the waltzing, brush-driven “Snuffaluffagas” homages Ahmad Jamal, while “Hard Boiled Soup” honors McCoy Tyner, throwing fractions of Kenny Barron into the mix. In turn, “Balliou for Bartok” heads into the bolero mode as it celebrates the classical virtues of Hungarian Béla Bartók. Anjou is a virtuosa with a determined touch and nimble liveliness. This accomplished body of work, which took 13 years to be completed, is sufficiently gratifying to make us wonder what her next plans are.